Low rarity booster stuff cuz it’s a weekday! Scrunch on, everybody. AUTO (R) GB1: [Put this unit into your soul] When your other rear-guard is put into your deck, you may pay the cost. If you do, choose up to two cards with “Chouchou” in their name from your hand, and call them to separate (R) in the same column. AUTO (R): [CB1, Choose one of your other “Chouchou” rear-guards, and put it on the bottom of your deck] When this unit’s attack hits a vanguard, you may pay the cost. If you do, draw a card. AUTO (R) [1/Turn] GB1: During your turn, when your rear-guard is put into the deck, choose one of your units, and it gets Power +4000 until end of turn. For Today’s Card’s Card, from the Clan Booster “Prismatic Divas” (on sale July 7th), we’re introducing cards that strengthen 《Bermuda Triangle》’s new theme “Chouchou, Suguru” and “Chouchou, Frara”! 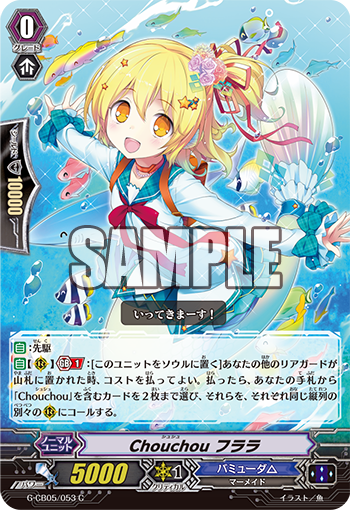 “Chouchou, Suguri”, when her attack hits a Vanguard, you can place another “Chouchou” Rear-guard on the bottom of the Deck, to draw 1 card. It’s incredibly powerful as you can combine it with Trigger Units and Units whose abilities activate when returned to the Deck! And, when an ally is placed in the Deck, you can choose 1 Unit to gain Power+4000. So increase a Unit’s Power together with its On Hit Ability! And, “Chouchou, Frara”, when a Rear-guard is placed in the Deck, activates her ability. By placing herself in the Soul, you can choose 2 “Chouchou” Units from your hand, and Call them to the same Column! And since its ability activates even during an attack, you can set up for multiple attacks. “Chouchou” has many Units whose skills activate when a Rear-guard is returned to the Deck, allowing you to activate all sorts of abilities. From here on out, for “Today’s Card”, we’ll be introducing cards from “Prismatic Divas”! Please enjoy!